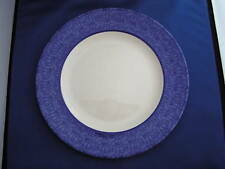 The small plate has stronger coloured speckles than the dinner plates. One dinner plate has a fault on the rim & a dark brown mark where it. shouldn't be, see the close up. 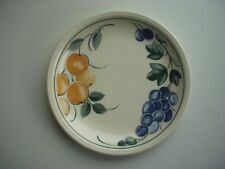 Retro Kathie Winkle Design Plate. Imaged is an in manufacture mark on the face of the plate. Staffordshire Ironstone pottery Ltd. 'Beefeater' dinner plate. Green and white. In excellent condition looks unused. Antique Staffordshire Serving Bowl/Tureen. Willow Pattern. Antique Staffordshire Serving Bowl/Tureen. Willow Pattern.. Dispatched with Royal Mail 2nd Class. Unsure if this item is supposed to have a lid, hence the low starting price, but even without a lid this makes a beautiful serving bowl. 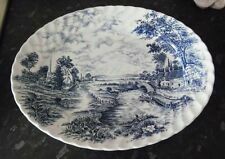 In good condition for age, manufactured by Staffordshire pottery and in the popular willow pattern. Lovely square shape with handles. 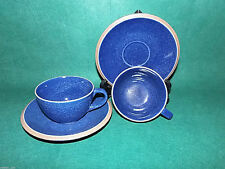 Charming Vintage Blue and White Staffordshire Pottery Stowaway 18 Piece Tea Set, date stamped 1973. Handed down through family. There is a lot of damage to the box. There is slight crazing on 2 of the plates and one of the saucers - please zoom in and examine photos. You can message me any time with questions. Thanks for looking! KATHIE WINKLE CHINA. 1 MILK JUG. 1 LARGE COFFE POT (22 cms TALL). 7 SIDE PLATES. Beefeater Cow Plate. English Ironstone. Retro. 25 cm diameter. In good condition, a few slight signs of usage. The Constable Series Bicentennial. Check out the pictures. 2 x Vintage 1970's Beefeater Steak And Grill Plate English Ironstone Pottery. 2 x Vintage 1970's Beefeater Steak And Grill Plate English Ironstone Pottery.. Condition is Used. They come from a smoke free and pet free home Dispatched with Royal Mail 2nd Class. Vintage Staffordshire Chefware Blue/White Stripe Bowl Good Condition. Dispatched with Royal Mail 2nd Class. Smoke / Pet free household. 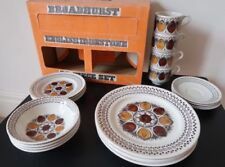 Vintage Ironstone Beefeater Plates X 2. Condition is Used. Dispatched with Royal Mail 2nd Class. It is Ironstone number 4405. by Stafford in the Yorkshire pattern. This pattern features a village scene with hay wagon houses and people. Set of 2 round plates with scalloped edges made. Very detailed work. Stafffordshire Ironstone Chef Ware Blue and White Milk jug 13cm high, small hairline crack at top of handle as shown in last picture.Dispatched with Royal Mail 2nd Class. 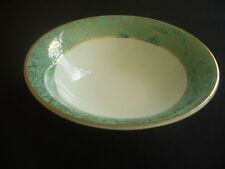 staffordshire ironstone pottery Dinner Plate. Condition excellent. Dispatched with Royal Mail 2nd Class. Staffordshire Bicentennial Side Plates x6. Staffordshire LIBERTY BLUE Ironstone 6 3/8" COUPE CEREAL BOWL "Mount Vernon"
Staffordshire LIBERTY BLUE Ironstone 5 3/4" SAUCER "Old North Church"
Staffordshire LIBERTY BLUE Ironstone CUP & SAUCER "Paul Revere/Old North Church"
YORKSHIRE MULTICOLOR BY STAFFORDSHIRE IRONSTONE SAUCER FARM SCENE #4405 5-5/8"
Staffordshire LIBERTY BLUE Ironstone 9 7/8" DINNER PLATE "Independence Hall"
Vintage Liberty Blue Staffordshire Ironstone Independence Hall Plate, 9 3/4"
Staffordshire LIBERTY BLUE Ironstone 5" FRUIT or DESSERT BOWL "Betsy Ross"